East End : Exit I-70 at Vail exit 176 and take the North Frontage Road west to Red Sandstone Road. Turn right and follow to the winter road closure gate and park here. Be aware that there is not a lot of space for snowmobile trailers, however. Follow Red Sandstone Road 6.9 miles to Moniger Road. West End : This trail can be accessed from its west side as well. To do this, travel west on I-70 to Wolcott exit 157. Turn right at the end of the ramp, left onto Route 6, and right at the bridge onto Highway 131 toward Steamboat. Follow Hwy 131 north approximately 2.5 miles to the unmarked turn onto Muddy Pass/Moniger Road #701 just past signs for the county landfill. Park here. It is approximately 6 miles up to Muddy Pass where this map begins. Attractions/Considerations : Commercial snowmobile tours are run up Red Sandstone Road so it receives somewhat heavy traffic to the turnoff for Moniger Road. To avoid this traffic, consider starting from the west end described above. The route is groomed from the start of Red Sandstone Road to Muddy Pass. The Red Sandstone area consists of 63 miles of roads usable for snowmobiles or cross country skiing. 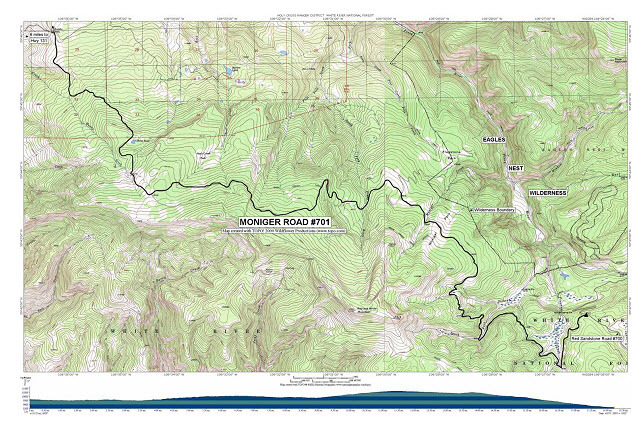 Any forest road in the area can be used except where signed for closures. Excellent views of the Gore and Sawatch Ranges are abundant. Trail Highlights : This groomed road follows gentle terrain from Red Sandstone Road to Muddy Pass for 18.3 miles.